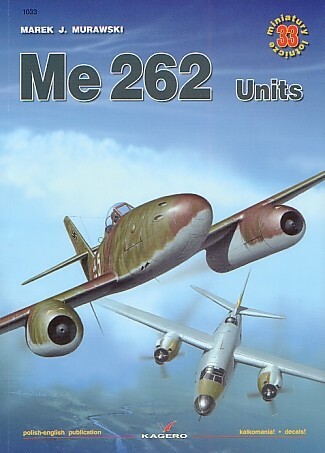 The Messerschmitt Me 262 makes another appearance in book form but not as you would expect it. This latest Kagero publication takes a look at the Units that flew this groundbreaking aircraft. At 104 pages, it is quite thick for its size, helped of course by the inclusion of both Polish and English text. Everything is reproduced on good quality gloss paper with a helpful sub-chapter indicator printed in the outer margin of each page. There are over seventy black and white contemporary photos and these show both the machine and the men that flew her. An interesting selection is provided and the standard of printing is good. Most of the photographs are reproduced to either one third or half page size, and are as clear as the size limit will allow. A “walkaround” series of colour pictures is also included. This being of the National Air and Space Museum’s Me 262A-1a, WNr. 500 491. This includes six images with the engine cowls off. An added bonus with this type of book is the included decal sheet. Techmod prints it and my copy was in perfect register. The carrier film is very thin and the colour density looks to be good. 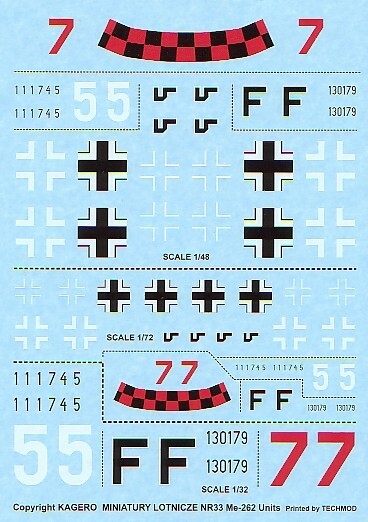 Representations are provided in both 1/72 and 1/48 scale and they also include the Hakenkreuz for the tail. Stencil data will have to be found elsewhere. Three aircraft are presented on the decal sheet and these are all illustrated in colour on the publications card covers. Three varied choices are given for the modeller to choose from and these are as follows. 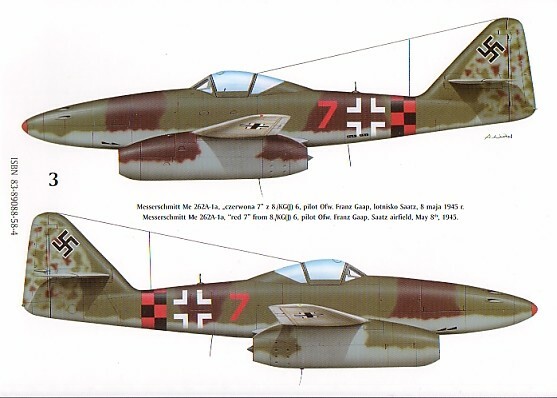 As well as a general discussion on Me262 camouflage colours, the author also describes his interpretation of the schemes provided. The text follows the fortunes of each of the gatherings that operated the type. These include the evaluation, fighter, bomber, night fighter, reconnaissance, and enigmatic industry defence Units. What really brings this book to life is the number of individual stories told by the pilots themselves. These can be quite enlightening and add a human touch to the operational conditions these people were subjected to. The author has taken an excellent path with this publication. What could have been a dry blow-by-blow account of the operational duties of a 262 Unit has instead become a very readable and personal account of the experiences within those groups of people.